Who was the man who saved Captain Lawson? · Are there any living relations of Captain Lawson who might be able to put some light on this event? 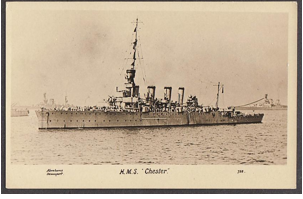 · What medals were awarded to the crew of the Chester? HMS Chester and HMS Canterbury were out of each wing of Horace Hood’s 3rd Battle cruiser Squadron’s flagship, HMS Invincible. With her were also from the 4th destroyer flotilla: HMS Shark, HMS Acasta, HMS Christopher and HMS Ophelia. HMS Chester. She’d been commissioned less than a month. Captain Robert Lawson heard the sounds of Hipper’s battle cruisers and headed in that direction. Unluckily he headed straight into the SMS Frankfurt, of Hipper’s 1st Scouting Group, steaming five miles north-west of the disengaged side of Hipper’s battle-cruisers, with the Wiesbaden, the Pillau and the Elbing. They had been busy chasing Evan-Thomas’s 5th Battle Squadron and the surviving four battle cruisers of Beatty’s two battle-cruiser fleet squadrons, the 1st and the 2nd. Chester signalled a challenge and made an error on the response. She approached to within 5,000 yards. As a newly commissioned ship, her crew was not completely battle-ready and unprepared for the withering fire that was let looses. Within three minutes most of her ten guns had been hit and three were out of action; the forward one was the first to go. That was where Jack Cornwell was manning a gun. 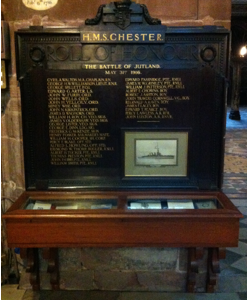 The small and very intimate memorial to HMS Chester and her crew in Chester Cathedral. Below decks there were men lining the passageways with horrific injuries to their legs and feet. The shrapnel has scythed most men’s limbs off.